Lumber and Building Materials with historic roots at Big Creek Lumber. Big Creek Lumber is a family-owned and operated company that has been serving Central California since 1946. We currently operate five retail lumber yards, a sawmill, wholesale division, forestry department, and logging operation. The business was founded in 1946 by Frank McCrary, Sr., his brother-in-law Homer Trumbo, and two sons, Frank “Lud” McCrary Jr., and Homer “Bud” McCrary. Big Creek Lumber owns timberland and manages timber for private landowners, harvests timber, and operates a sawmill, manufacturing facility, wholesale division and five Pro Dealer retail sales yards. We take great pride in a long history of superior forest stewardship. We utilize a framework of progressive and conservative forest management practices, like selective harvest, to manage viable redwood forests that will remain productive and enjoyable for future generations. Big Creek Lumber is the first wood-products company operating within a redwood forest to have company lands awarded the “Well Managed Forest” Certification by the Forest Stewardship Council (FSC)®. We have a long-standing reputation for the high quality of the products we produce. Big Creek Lumber’s sawmill and wholesale divisions manufacture and sell a wide variety of redwood lumber to lumberyards and manufacturers. Our mill produces a range of different grades suited to a wide variety of uses and applications. Customers at our retail locations can expect expertise and extensive product knowledge from our employees. We aim to foster meaningful relationships with our customers that result in mutually beneficial business interactions for years to come. The history of Big Creek Lumber is an integral part of what the company is today and extends back much further than the seventy-plus years we have been in business. In the spring of 1863, Joshua Grinnell, along with his wife and young step-son Vid Trumbo, started the journey west via wagon train from their home state of Iowa. Grinnell, already familiar with the central coast of California from his time spent working on whaling ships in the area, settled his family in Santa Cruz County at the end of the year and a half long journey. By 1869 he was able to mine enough gold along Major’s Creek and its tributaries north of Santa Cruz to buy a 147-acre tract of land and start a small farm along Big Creek in the area now known as Swanton. Seven generations later, his descendants, the McCrary’s, still call the area home. Frank McCrary Sr. arrived in the Swanton area from Alaska in 1920. Along with a brother who had preceded him to the area by two years, he made a living making redwood split stuff, doing carpentry work and operating a shingle mill. McCrary woodsmanship and Big Creek land were joined in 1924 when Frank married Vid Trumbo’s daughter, Agnes. Big Creek Lumber got its official start in 1946 when Frank and his two sons Bud and Lud returned from overseas service in World War II, and, in partnership with Agnes’s brother Homer Trumbo, formed the Big Creek Timber Company. With $7500 in cash and war bonds, surplus military equipment modified to fit their needs, a homemade mill nicknamed “The Termite,” axes and cross-cut saws, the quartet set out to log portions of Mill and Scotts Creeks. In 1947 the company purchased the timber rights on a piece of property in Waddell Canyon from Theodore Hoover. The company constructed a sawmill several miles up Waddell Creek Canyon, and in 1948, built a small planing mill along Highway 1 near Greyhound Rock where lumber from the sawmill was surfaced. By 1955, the sawmill was producing 35,000 board feet per day. After several location shifts due to natural disasters, fire, and property acquisitions, the sawmill came to rest in its current location in 1964 above Highway 1 just south of Waddell Canyon, joined by an office, planing mill, forestry department and maintenance shop. Big Creek Lumber operates five Pro Dealer retail yards in Santa Cruz, Watsonville, Paso Robles, Atwater and Half Moon Bay. Today, Big Creek Lumber’s mill cuts, planes and processes approximately 100,000 board feet of lumber each day. The company employs approximately 200 employees at six locations. The Davenport location includes manufacturing, wholesale, maintenance shop, forestry and administration facilities. Big Creek Lumber also operates five Pro Dealer retail yards in Santa Cruz, Watsonville, Paso Robles, Atwater and Half Moon Bay that provide a comprehensive selection of lumber and building materials and services to professional contractors and homeowners. Big Creek Lumber now owns timberland in Santa Cruz, Santa Clara and San Mateo counties, and manages land for a number of other private landowners. Since Joshua Grinnell’s arrival on Big Creek in 1869, his descendants have recognized their important relationship with the land they steward. From it, the McCrary family receives its livelihood, identity and lifestyle. The success of the business allows them to retain the land and maintain its nearly natural state. This conscientious stewardship is one of the main reasons Big Creek Lumber has been widely recognized for its strong environmental ethics. Throughout the past 70-plus years, Big Creek Lumber has taken the initiative to find solutions to the environmental and aesthetic concerns frequently associated with logging and has been a leader in setting standards for responsible forestry practices. Big Creek Lumber has been the recipient of many awards acknowledging these efforts, including the prestigious Francis H. Raymond Award in recognition of outstanding contributions to forestry in California, the California Department of Fish & Game Private Sector Award in recognition of outstanding wildlife achievement, and the Well Managed Forest Certification by the Forest Stewardship Council (FSC)®. Lud and Bud McCrary held the leadership role for Big Creek for many decades. In 2009 they stepped down from their positions as President and Vice President but both remain a part of the business and serve on Board of Directors. After years in the business Lud’s daughter Janet McCrary Webb took over as Company President in addition to her role as Chief Forester. 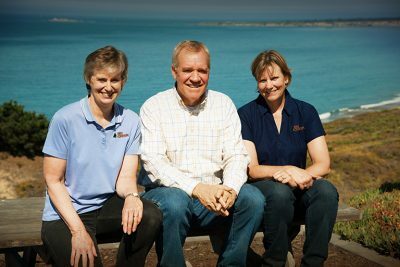 Lud’s daughter Ellen Rinde and Bud’s son Ken McCrary became Vice Presidents. These three form the core of a terrific leadership team. We are proud that there are currently seven McCrary family members employed at Big Creek Lumber, including one 4th generation employee. 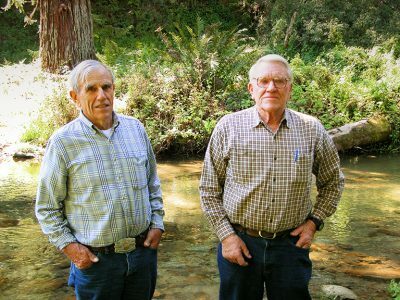 Lud and Bud McCrary like to point out that the forests of the Santa Cruz Mountains are in better health today than when they first started logging with their dad and uncle in 1946. 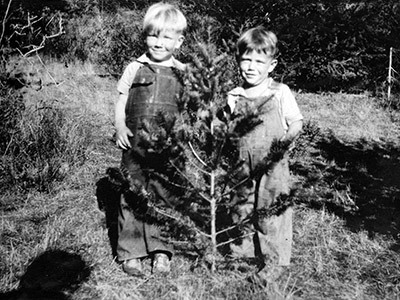 Today, the stump of the first tree that Lud McCrary and Homer Trumbo cut by hand sprouts a 30-inch diameter, 150 foot tall redwood.